CDXRadius is a right-click function that returns a list of zip codes located within a radius of given zip code. It can be employed as a right-click function as well as input directly into your worksheet as a custom function formula. (Please also refer to the help section on custom functions.) 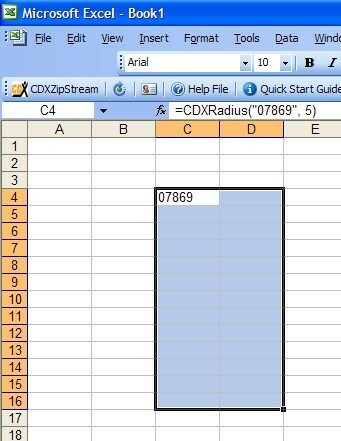 With Basic and higher versions of CDXZipStream, this function can embed radius or drive time maps into your worksheet. If you have purchased the Canadian postal code database, you can also use it for radius analysis of postal codes. 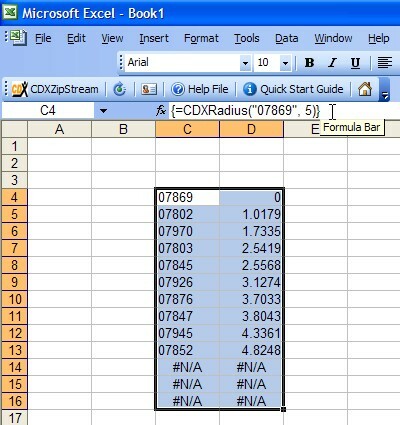 Please refer to the Youtube video Find Addresses within a Radius for a quick demonstration of CDXRadius and how it can be used to filter large address lists. Zip Code - the specified zip code that represents the center of the region of interest. You may use the actual zip code (such as "06830") or the worksheet cell location of the zip code ("C4"). Result Output - the returned list of zip codes (and their distance from the specified zip code) can be returned as an array formula within a range of cells, or as a single string contained within one cell. 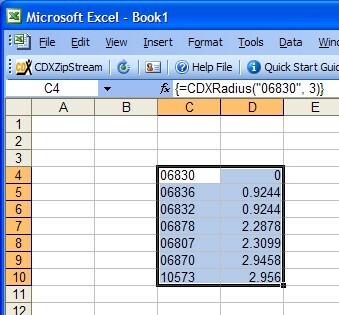 You can also specify to embed a radius map created with MapPoint into an Excel worksheet as part of the Basic and Premium versions of CDXZipStream. This feature is not available with the "Lite" version of CDXZipStream. In addition, you have the option (with Basic and higher versions) to obtain a drive-time radius map; these maps display polygons delineating the area within a specific drive time of the zip code. Returned Rows - if the data is returned as an array, the number of rows that will contain the returned zip codes. If you have purchased the Canadian postal code database, you can also specify the database to be for the United States, Canada, or both. "M" specifies that the distance values are all in miles. Alternatively, you can specify "KM" for kilometers or "NM" for nautical miles. The Result Output is specified as 1, indicating that the data will be returned in a single string. 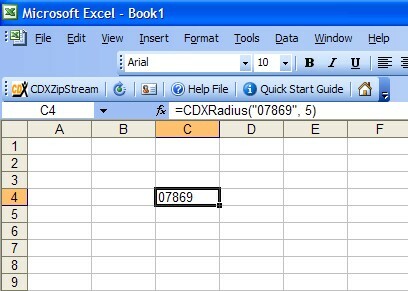 There is a new set of brackets automatically inserted around the formulas in each selected cell, which Excel uses to indicate this is a member of an array. You may not delete or move just part of the array - the entire array must be deleted or moved, if desired.